We all have a creative aspect to ourselves; the trick is to find it, and that can be a challenge. For some it's baking, decorating, pottery, glass blowing, painting, sculpting, or a myriad of others to choose from. If you're still looking for your creative aspect, why not try your hand at lettering. 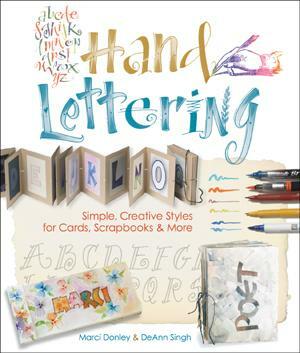 There are so many beautiful ways to use this talent — cards, gifts, notes, book covers, scrapbooking, and bookmarks to name a few. You could turn your new craft into a money-making hobby. Marci Donley loves the written letter and has a skill she's passing on — penmanship. Rare these days, but there are many of us who'd like to develop our love of making something beautiful from a thing as simple as a letter of the alphabet. Donley shows us the Druid Alphabet, Draftsman Alphabet, Roman Alphabet, Chunky Neuland Alphabet, and Brush Italic Alphabet among others. Tools are also discussed — you'll know how confusing choosing pens can be if ever you've stood mesmerized at a display of pens and other writing instruments. Fascinatingly, Donley shows other less expensive instruments like the ingenious picks and sponges on pages 22 and 23. Then there's the choice of paper — endless. You'll learn many tricks of the trade as it were, even if you don't like to "color inside the lines" — always make your art your own. And, you can use your computer and printer to make custom creations on paper. Projects I liked are the birthday bag on page 69, the card on page 66, and the cards on page 113. Conclusion - A delightful new craft to try out.